With employers cutting back on more and more benefits, it’s not uncommon to find yourself without health or dental coverage. Fortunately, there are ways to afford your dental care even if you don’t have dental insurance coverage. Here are some resources you can tap into if you don’t have dental insurance. You’ve probably heard commercials on the radio inviting you to be part of a clinical research study for a new medication. Generally, the company doing the research will let you try the medication for free as long as you report on how it affects you. Although these clinical studies are often for obscure or very specific illnesses and disorders, you might be able to find one that will cover your specific dental needs. Sites like ClinicalTrials.gov are valuable resources if you’re looking for free research trials in your area. As with medical students and hairstyling students, dental students need to practice and acquire experience while they are in school. 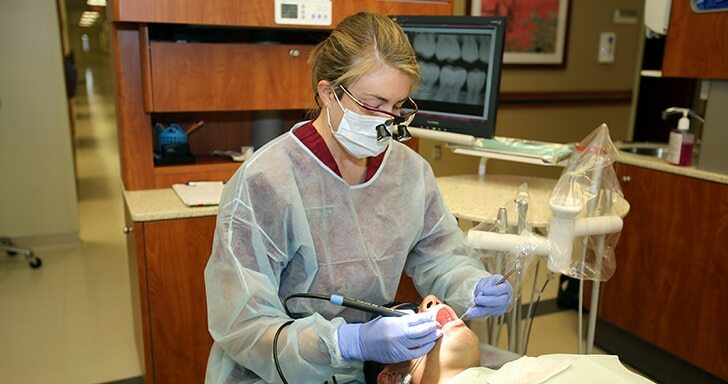 Often, dental schools will offer discount rates for those willing to let students perform their dental work. The American Dental Association website has links to dental schools in the USA and Canada, so you can find one near you. You’re probably familiar with free medical clinics in your area, but did you know that you can get dental work done at these clinics as well? Not all clinics offer dental work in addition to medical, but you may be able to find one in your area. The American Dental Association and United Way are two resources to look into when trying to find free or discounted clinics. Because these free clinics are generally limited to low-income patients, you should also see if you can find a dentist who offers a sliding pay scale. Websites like Groupon and Amazon Local offer coupons for various services every day, usually for a pretty good price. If you don’t want to subscribe to emails from these sites, you can check the newspaper for coupons for local dental offices. New dental offices will often offer discount services for the first few weeks of operation in order to grow their client base. Keep an eye open for new dentists in your area, and see if they’re offering discount services. Even now, in the 21st century, some people are willing to exchange services instead of money. If you are a mechanic, offer free oil changes and tune-ups for your dentist until your dental procedure is paid off. If you have skills in internet marketing or website design, you can offer these services in exchange for dental care. While bartering your services may seem like a shot in the dark, it never hurts to ask. If you have a service you think could be useful to your dentist, ask if he or she would be interested in a trade instead of a money payment. If the only thing keeping you from using dental insurance is the fact that your employer doesn’t provide it, it’s time to look for other options. There are many private dental insurance providers that you can buy insurance from. Some providers offer group insurance, so consider going together with your extended family or neighborhood friends. If you choose to go for individual insurance, there are ways to lower the cost. As with any insurance, one way to lower your monthly costs is to set a higher deductible. Also, some insurance providers may offer lower prices for obtaining care from specific dentists. Of course, there is no substitute for taking good care of your teeth at home. Regular brushing and flossing is the best thing you can do, and it’s always important to avoid foods that will damage your teeth. If you’re worried about being able to afford dental care, it’s better to be safe than sorry.